ID-NR4 is a market structure feature that I don’t purposely look for – my strategy should pick up these setups just due to the presence of S/R. However it may be a concept that appeals to you. If that’s so, it’ll make an easy addition to your analysis routine, taking about one second to determine whether it’s potentially in play or not. Let’s look at the ID-NR4. I’m not sure of the originator of this concept. I believe I first heard of it in Linda Raschke and Larry Connors excellent book, Street Smarts. I believe they got it from Tony Crabel. I’ve seen it in several other sources as well. In any case, it’s very simple. ID stands for Inside Day. That is a daily candle which has a high below the previous day’s high and a low above the previous day’s low. So the whole range fits within (inside) the range of the previous day. NR4 stands for narrowest range of the last 4 days. An ID-NR4 candle meets both the ID and NR4 requirements. Let’s look at a recent example. The daily chart below identifies an ID-NR4 candle on Nov 17th. You can visually see that the range of this candle exists inside the range of the previous candle; plus the range is the smallest of the last four days. The concept behind ID-NR4 setups is that of range contraction and expansion. Narrow sessions cannot last; and a breakout of these sessions will tend to produce a trend day, due to a combination of breakout entry orderflow, and stops from those exiting their opposite position. Note the breakout of the high of the ID-NR4 candle in the above chart leading to a large bullish candle; evidence of a trend day. The common advice is to simply trade this from the same chart… with a stop entry order above the high and another below the low. In this way, you’re able to catch the entry regardless of which way it breaks out. When triggered into a trade, a stop loss is placed at the opposite side of the candle. The other (unfilled) entry order is often left in place, in order to provide a stop and reverse entry, should the initial breakout prove to fail. That’s fine… for daily chart traders. I’m an intraday trader and just not interested in the 96 pips risk that comes from such an entry (the above candle having a low of 1.5852 and a high of 1.5946; orders therefore being a stop entry short at 1.5851 and a stop entry long at 1.5947). Plus I’d die of boredom waiting for the outcome of such a trade setup. For those of you like me… the concept can still be useful in identifying an intraday setup. Let’s look at the 3-minute chart below, which demonstrates how I’d play such a setup if I traded the ID-NR4. Any setup entered within the previous candle range will be possibly held for a little longer, with an expectation that if it can break out of the high/low it will potentially lead to a large trend day. However if a position is not held at the time of breakout, I’ll then look for the first pullback entry post-breakout. So, we had two potential entry locations on this particular day. Firstly a long on the test of the Asian session lows, within the previous ID-NR4 range and offering massive reward for an 11 pip risk (yeah I know… hindsight based example… they’re RARELY this good in real life!!!!). 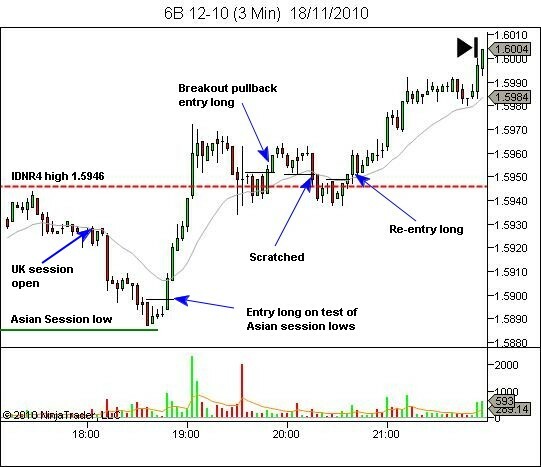 Then, if that was not taken, there were two opportunities for a breakout pullback entry. The first I would most likely have scratched for a couple of pip loss. The second allowing re-entry and then never looking in danger. As I said at the beginning… this is not something I use. I rarely look at the daily charts. And my analysis of the S/R levels usually provides me with similar setup locations anyway. However you may wish to add this setup to your playbook. The big advantage over my approach, is simply an awareness of the potential for a larger trend day following the breakout. I may miss that due to not looking at the daily charts. Each to their own though!!! Have a look through daily charts when you get a spare hour or two. 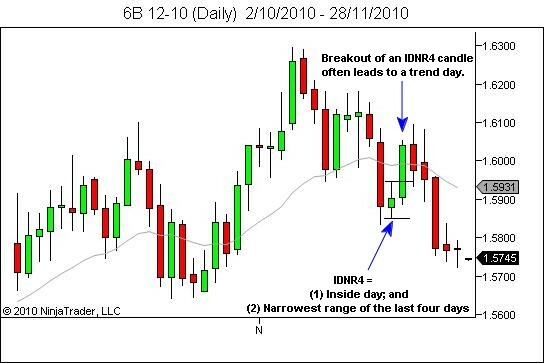 Identify ID-NR4 candles, and examine the potential for producing a good trending move. If you like that, you may also wish to check out NR7 candles… same concept, although they have the narrowest range of the last 7 days, and don’t have to be an inside day.